to The Food Bank of Lincoln. A great time for a great cause. What to bring: Bring both a white and a dark shirt, cleats or athletic shoes, and a water bottle. Who will you support: The Food Bank of Lincoln, who help to alleviate hunger in Southeast Nebraska. Bonus support: You can get an extra raffle ticket for each can of food you bring. No Ramen please. To see what items are most needed by the Food Bank, click here. What the heck is Speed-Point? Only 2 pulls per game – 1 at the beginning of each half. 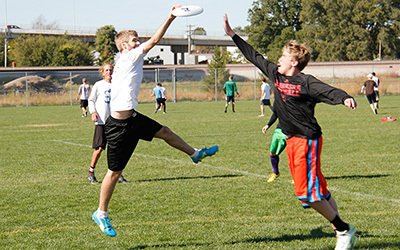 After a point is scored, the player with the disc sets the disc on the ground where they caught the score, and an opposing player can either a) initiate play at the spot, or b) bring the disc up to the line to initiate play. Sub-ins are on-the-fly at mid-field. Stall count goes to 8 instead of 10. The field is smaller - 30 yds wide, 50 yds long proper, 10 yd endzones. Games go to 19, or last 50 minutes, whichever comes first. 2 minute halftime at 10. Teams will have between 9 & 12 players, depending on the number of registrants. 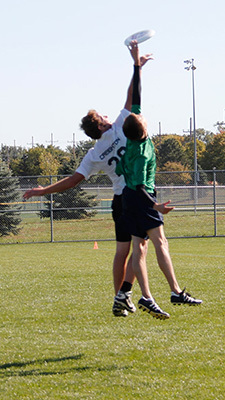 8 teams - 2 pools of 4 with round robin play; winners & losers brackets afterward. 6 teams - 4 games of up & down tournament play; final games based on seeding. 4 teams - 1 pool with round robin play; bracket play. LollapaLUDA is a co-ed tournament, for everyone over the age of 16, regardless of skill level, experience, or athletic ability. This is for a good cause, and we're here to have fun! LUDA will bring water from Planet Earth, bagels from Bruegger's, fruit and peanut butter. All proceeds from registration fees will go to the Food Bank of Lincoln. This is the way to go if you are coming in from the south. A big thanks to our sponsors, and everyone that is helping out with the event!